This is quite possibly the easiest craft ever. It's so easy, I don't know if it should even be called a craft, since the least craftiest of people could do it. But calling it a craft makes me feel better about myself, so that's what I'm going to do. 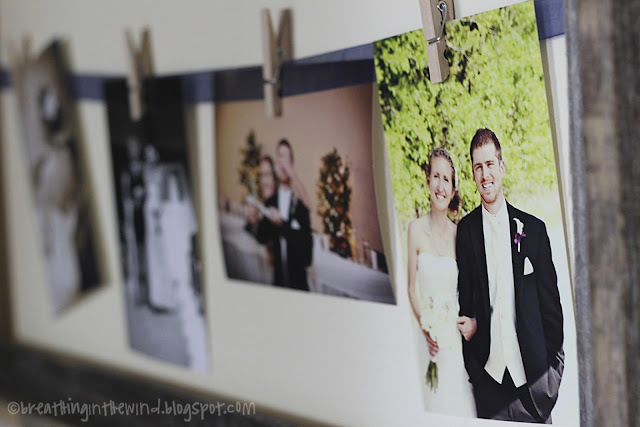 I have been wanting to display more of our wedding photos in our apartment, but I didn't want to go the route of individual picture frames. I was over at a friend's house a few weeks ago, and I saw that she had hung pictures inside an empty wooden frame. She said she got the idea from Pinterest, of course, because these days that's where all the good craft ideas come from. So today I decided to make one, and it was super easy. First, pick up an empty frame. I got this one at Hobby Lobby for $12.00. It was half off, so make sure you go when the frames are on sale. 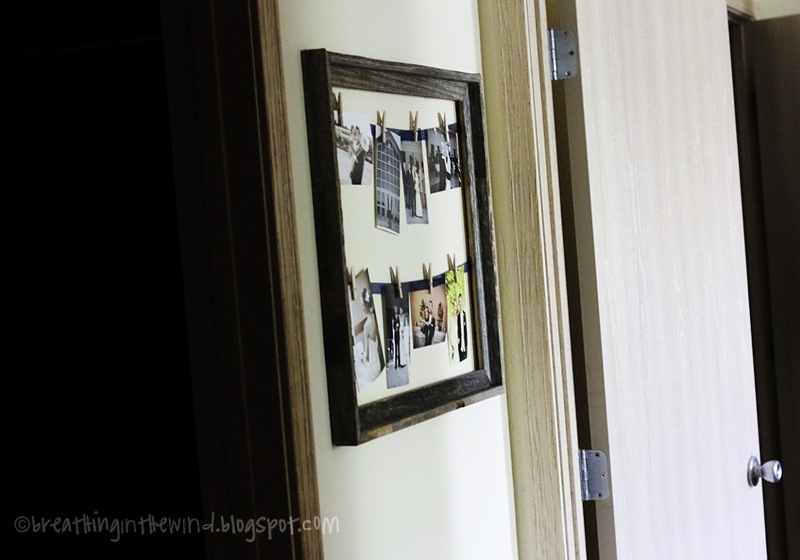 You don't want to spent $24 on a frame when you could spend $12, yes? Then, I cut a piece of ribbon I already had in my ribbon stash and stapled it to the back of the frame. I didn't take a picture of the back of the frame because it's literally ribbon stapled into the frame. Boring. 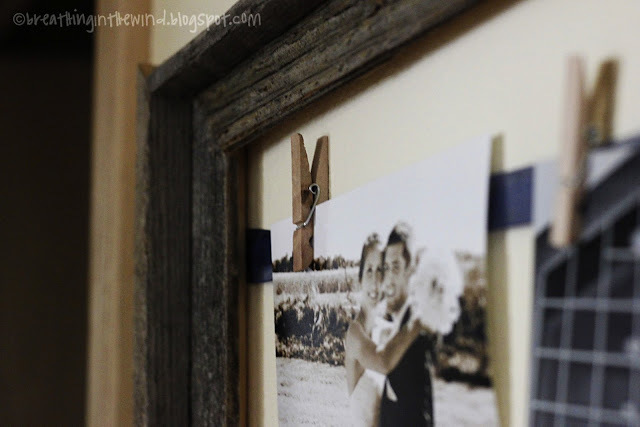 The final step is to choose your pictures and use miniature clothespins to clip them to the ribbon. These I also happened to have on hand, but you can find them at any craft store--the mini clothespins, that is, not the pictures. And that's it! Just find a good place to hang it. Your frame turned out so cute! I'm super tempted to break out some ribbon and a stapler and change mine up now. SO CUTE! Love it. I do something similar with the kids' art work. That way I can "showcase" it for a while before I throw it in the trash. Makes me feel like a good Mom. Don't judge. This is adorable! Great idea...and we know any great idea was pinned from Pinterest. Haha. I just might have to find a place in my house for one of these! Beautiful! 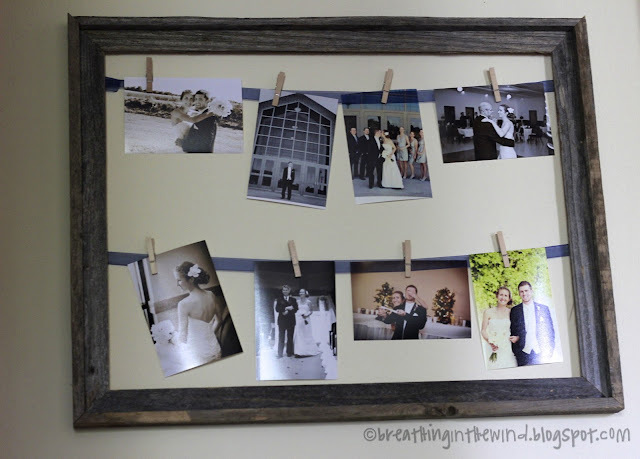 This seems like a great way to decorate some wall space while showcasing a whole bunch of different pictures. I have a big, blank wall that I'm looking to decorate so I'll have to see if i can find a big frame to fit the bill!